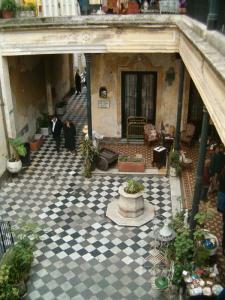 Argentina is a country of extreme contrasts, a reality vividly displayed even in the international city of Buenos Aires. As Fendi-clad locals and international jet-setters prowl the high-end restaurants and clubs, on the other side of the sidewalks the poor walk the streets pulling carts, sorting recyclables from the garbage and scavenging useable items. Although this country has a long history of economic divide, the crash of the peso in 2001 exacerbated social problems. In San Telmo, the many antique stores sell riches of the city’s past. I am an antique fiend, but shopping here is bittersweet – a palpable reminder of the city’s economic woes. 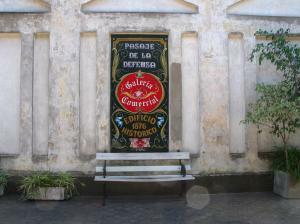 If you are looking for a keepsake of your trip – one that gives back as well as takes – try the Casa de San Antonio de los Cobres, in the gorgeous Pasaje de la Defense courtyard shopping area at Defensa 1179. Duck in off the street to the sunny patio, a 2-storied shopping area with worn tiled floors, fountains, and verdant plants. A non-governmental organization, Casa de San Antonio de los Cobres works on issues of social justice with a small community in the country’s northwest. The store sells beautiful artisan tapestries of llama and sheep wool, made by indigenous peoples of San Antonio. The handmade vests, shawls, carpets, and blankets are unique and exquisite, wonderful place-based artisan goods. Profits from sales support projects in health and education in the pueblo. And, of course, a tapestry packs nicely in a suitcase – much easier to transport than a crystal chandelier. This page rendered in 0.167 seconds.